The other day Mike@Ohm posted a really nice pink and grey combo on Instagram. I really wanted to try to make a pink and grey combo too, but don’t have a lot of grey beads. So I used the Pink Conch, Neptune’s Promise and Sea Anemone from the Trollbeads Delicate Kit. Just realized I now have half of that kit, so someday will try to complete it! I decided to combine it with an all silver Redbalifrog bracelet. Here’s the cute little Magic Monkey again. To the left of him are Sunflower and Frangipanis Forever. The Pineapple has such incredible detail, especially on the top. 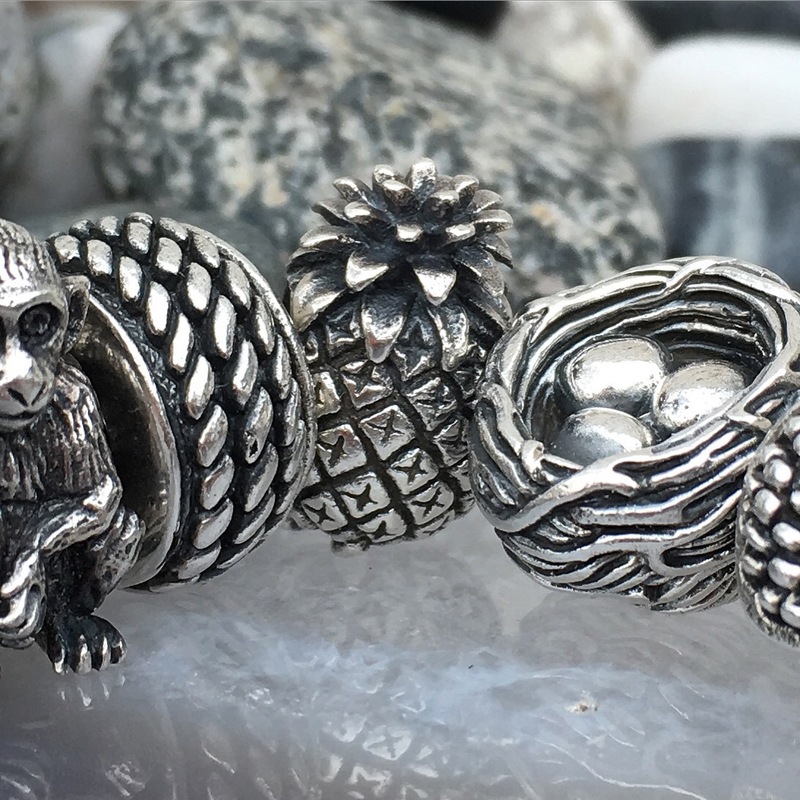 To the right of the Pineapple is The Nest, which in my opinion is one of the all time great Redbalifrog beads. It had started to snow yet again when I was taking these photos on Sunday! Grrr! 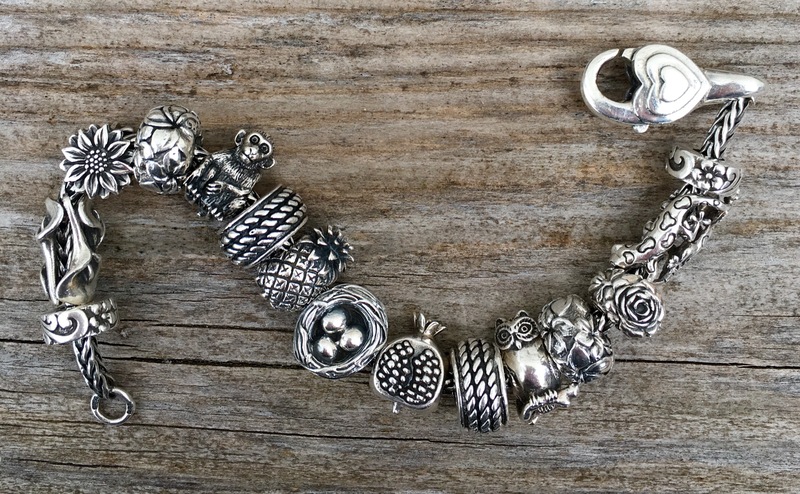 Here’s a view of the whole silver bracelet. 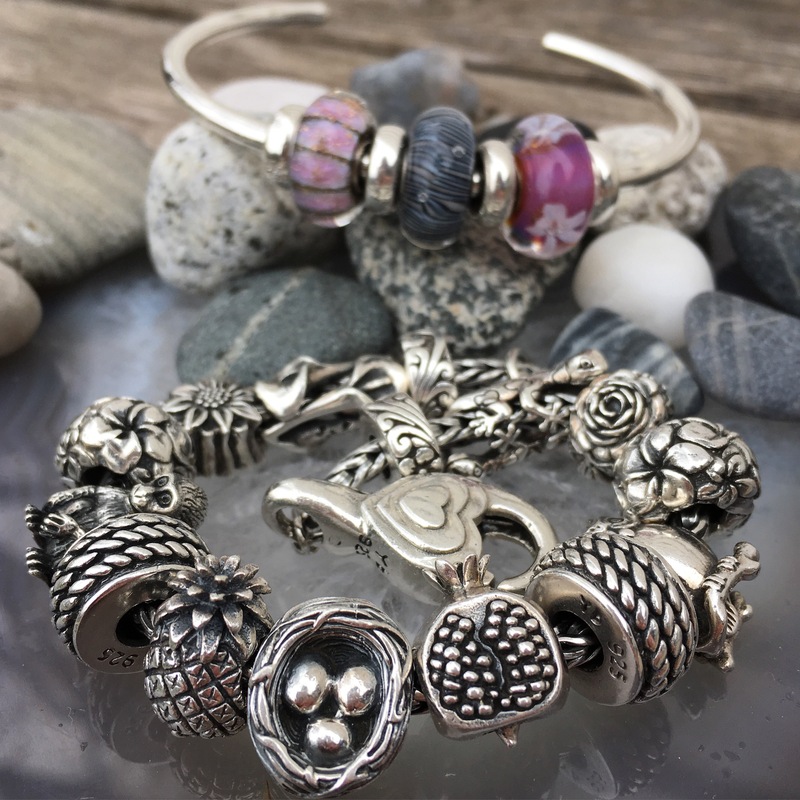 From left to right, the beads are Calla Lily, Sunflower, Frangipanis Forever, Magic Monkey, Rope, Pineapple, The Nest, Pomegranate, Rope, Night Owl, Frangipanis Forever, Roses and Geckos. Disclosure: On this blog I may receive some items as promotional samples. 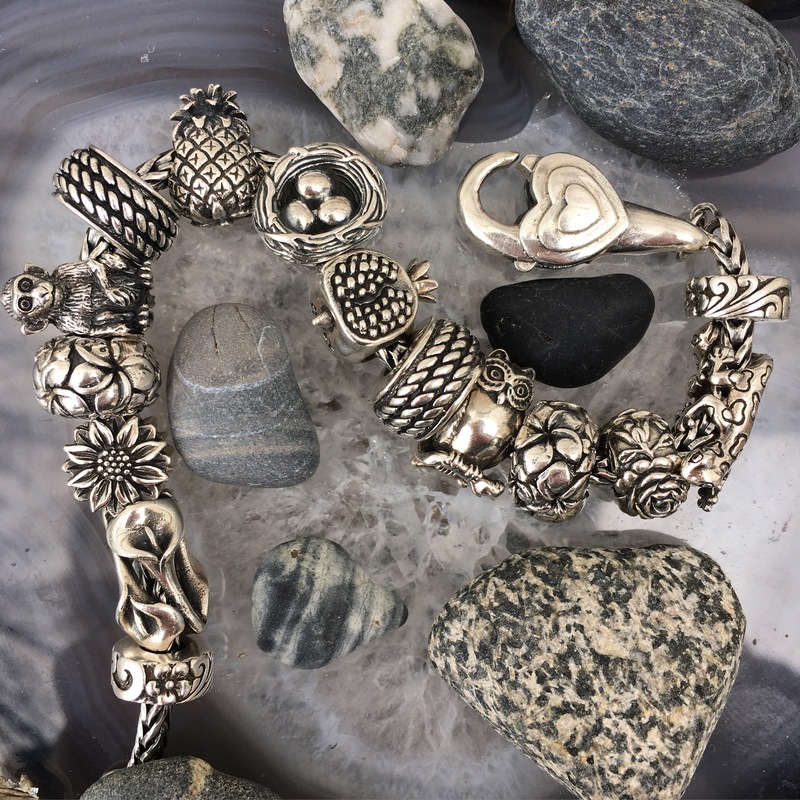 Redbalifrog has some of the nicest silver beads. Your photos really show all the beautiful details. I like the pomegranate and had never really noticed Roses. My favourites are still the Frangiapanis Forever, Monkey and Sundlower. 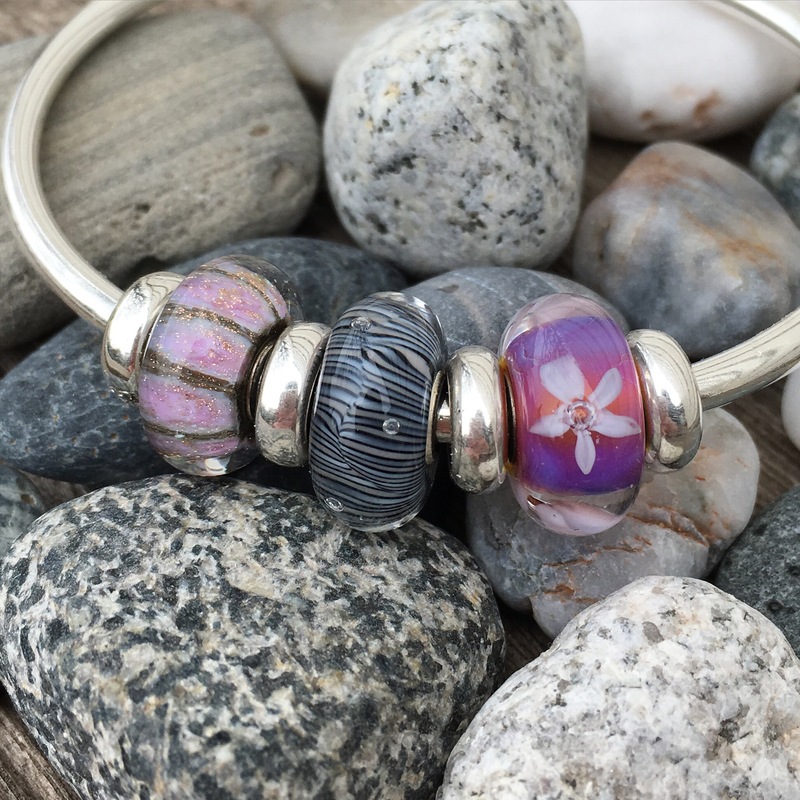 Of course your Trollbeads bangle and bead combo is lovely. Your Neptunes Promise is still the most beautiful example that I have seen. Thanks Sarah. I’m so happy I found that Neptune’s Promise. 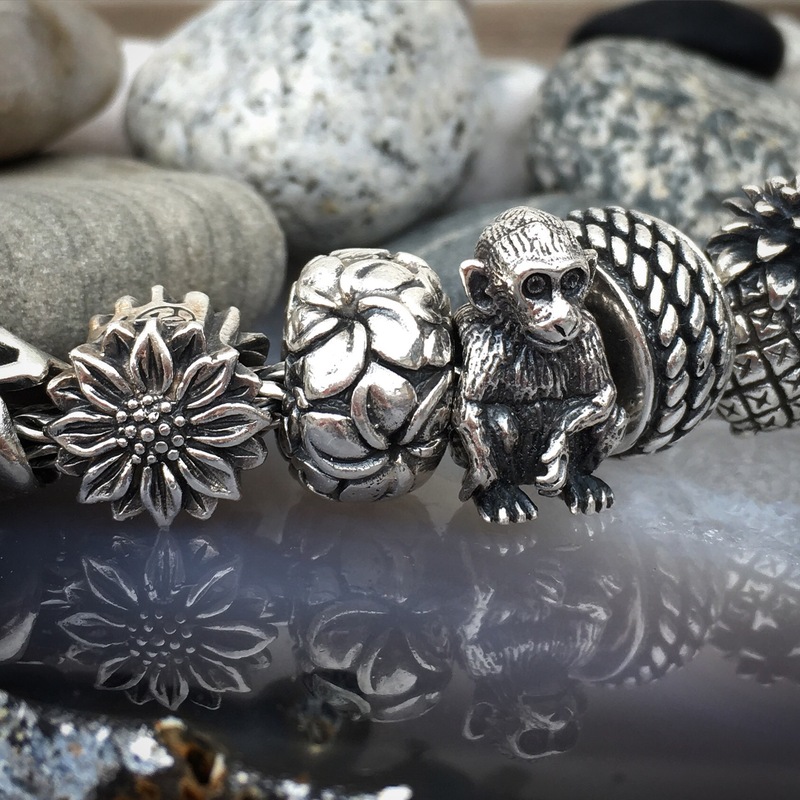 Redbalifrog silver is so different from other brands and each little piece has so much lovely detail. Have a great day! Our snow has almost melted! The silver bracelet and glass bangle combo are perfect together. I already said it on IG, but it’s worth saying again – the design of redbalifrog silvers is spectacular, they are the only silvers that imo don’t get lost in one big silver-merge without glass to frame each one. Amanda’s eye for detail is exquisite, and so are your photos. Hope the snow is melting, blasted stuff!!! I so agree with you, Debbie and see what you mean about the silver not getting lost. One’s eye really does stop to look at each piece individually. And yes, the snow is now gone and it’s supposed to be sunny and +21 C by Sunday!